Today, I got tasked with doing something I love. Writing. And with very little parameters except, the customer wants X as the end product. So, like the scribe that I am, I set to work and honestly, y'all. NAILED IT. I'm feeling great about the work I did, and excited that I got the objective and completed it with very little intervention. I may be getting the hang of things, after all. So, I am taking Friday off, because I need to kill a few days per my boss. And I need to get some last minute things taken care of for Halloween. I need to find candy I don't like...and I'm a sugar fiend, so - there are very few candies I don't like. Do you know why? Because there isn't a candy out there that uses mushrooms. 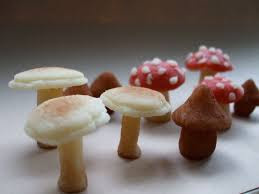 There's only a few candies shaped like mushrooms - namely, marzipan. And that's made of sugar and almonds, and that, y'all, is tasty. The brown ones look like tiny dongs. Anyway, Friday off. Thinking of getting a massage that day as the knot that lives under my left shoulder has come out of hiding and wants attention. It's hard to believe it's nearly November. We're starting to get some of that nice, cool fall weather, and I love that, of course. It's just tough to dress for that weather. Because while it's 52 outside, it may be 78 indoors, and those are disparate enough to cause discomfort. And of course, my skin is starting to dry out. I desperately need some new black shoes for the coming season. I have a pair of Mary Janes that I got either one or two years ago, and I've been pretty hard on them. They weren't expensive, they don't fit especially well, and it's time to get some new black shoes. The problem is, I like kind of ugly ones. I think Clark's, Birkenstocks, Borns - all are fabulous. I will always, always choose comfort over style. I'm also looking at a new coat. Because I can. I realized today when I was in a meeting, I was one of two people in jeans - the other was our CEO. It might be time to step up the game. Anyway. Not every day can be goats and parties and frolick. Sometimes it's meetings and documents and fish for dinner. But it's about balance. And I feel, that sugar cravings and backslides aside, I am in balance.